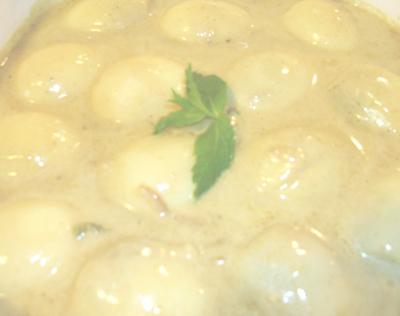 Dimer korma/ egg korma is a wonderful side dish which is egg cooked in milky sauce with bare amount of spice. Personally I have three different recipes for Dimer korma/ Egg korma. Today I will give easiest one with coconut cream. Coconut cream is a very handy item which you can find Asian section of your Supermarket. I know how pain it will be if I say that you need to paste the coconut and take out milk from that paste. Enjoy the easy version of egg korma. 1. Boil the egg with 1 teaspoon salt. 2. Let it cool and peel the eggs. Cut 3-4 long slits on each egg. 3. Heat the pan on medium high and add the onion. 4. Fry the onion till it becomes soft and add bay leaf, cardamom, cinnamon and clove. 5. After ½ minute add ginger and coriander and cook the till oil comes out. 6. Add salt andcoconut cream and cook it about 3 minutes. 7. Add ½ cup of water and take it in boiling point. 8. Add the eggs and chillies and cook it 2 minutes under closed lid. 9. Add cumin and sugar and stir it. 10. Let sugar melts and turn off the heat. 11. Serve Egg korma/Dimer korma with hot pilau/polao rice. Thanks Zora in village actually they use coconut milk, my mum use milk and poppy seed paste and I use what is available to me. i use cream sometimes too. To me fresh ginger is the most important part in korma.